Here's another $7 item from TJ's. One might justify that lofty price tag with the added bonus of a quality mason-esque jar you can keep long after the pie filling has been consumed. One might also justify that seven dollar premium with the notion that this stuff is pretty tasty. Because it is. After making the purchase, Sonia and I mused about whether or not we'd need to employ the recondite prowess of one skilled in the culinary arts in order to enjoy this unique delicacy because, unfortunately, neither of us are particularly gifted in that department—at least as far as pies are concerned. Sonia can make some tasty Mexican dishes thanks to some family recipes handed down to her from her parents, who, incidentally, were in town this past week. They brought delicious, authentic Mexican sweet breads from a bakery in Los Angeles. It seemed an obvious pairing to me, if perhaps nobody else, so of course I slathered a piece of the bread with this sweet blend of nuts and syrup: Mexican-American fusion at its rarest and finest. It worked. 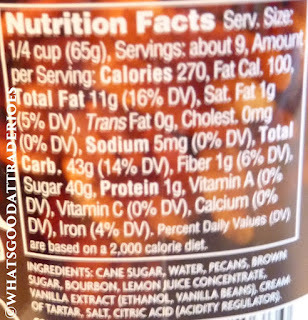 As long as you didn't mind the moderate alcohol essence from the bourbon in the pie filling. Other food pairings yielded similar results: ice cream, pancakes—and I can only imagine with cheesecake as well, as mentioned on the packaging—all super sweet and super tasty, but there was still that alcoholic kick. I'm well aware that the bourbon is less harsh after baking, and for that reason, I decided to try my hand at whipping up something in that big, hot, bakey thing in the kitchen that's not a microwave. What's it called again? "Oh-ven" or something like that? My baking experiment was a reasonable success, as I modified the pie recipe on the jar to use the filling in little crescent rolls instead. The process of baking and a good bit of butter certainly helped to mellow out the bourbon zing, and the pecans were even more tasty, as they picked up a lightly-toasted flavor and slightly crispier texture in the oven. Straight out of the jar, it's extraordinarily sweet—and bourbony, as mentioned before. 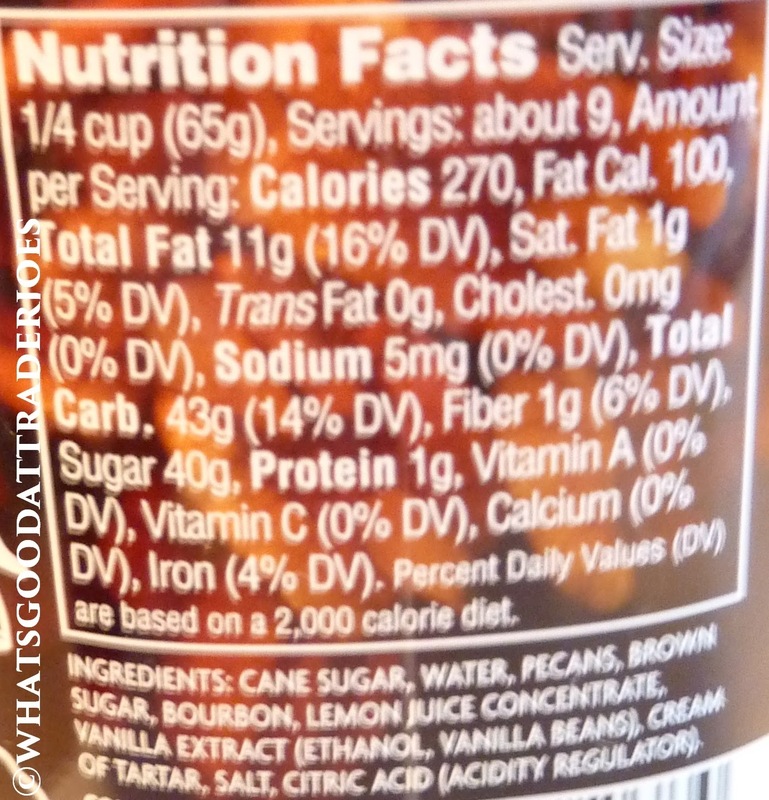 The first and fourth ingredients are both types of sugar. So yeah. Hope you brought your sweet tooth. It's really just a jar of rich, luscious, maple-esque syrup and a boatload of whole pecans. Between that Chocolate Pecan Pudding Pie and this, Trader Joe's must be single-handedly keeping the pecan farming industry afloat. I think this product is vastly more enjoyable and successful after baking, but Sonia is perfectly happy with it as a raw topping on just about anything. She gives it four out of five stars. Because it's expensive, wants to be baked, and a little too much like drinking pecan-flavored whiskey, I think I'll keep my score to a modest three out of five. But don't let this average-ish rating scare you away, particularly if you're blessed with mad baking skills. -strain the syrup. Chop the pecans and add bananas fold into pancake batter. Make pancakes and then drizzle the syrup on top. 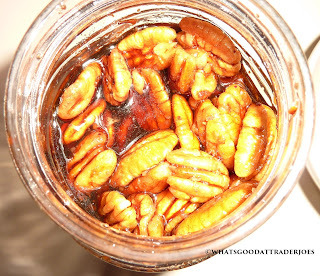 -Make chocolate covered "pecan pie" just separate the pecans and then drench into chocolate. 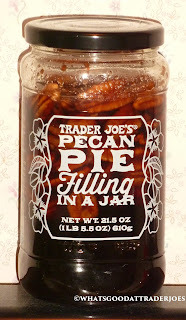 I saw pecan pie filling in an upper-end catalog for $19.95/jar, and I just knew TJ's had to be much less expensive. This is a deal! Yeah I guess $7 is a lot better than $20! I am blessed with mad baking skills and blessed (or maybe cursed) with mad bourbon loving skills! Your cries of "too much bourbon" makes me want it all the more! - it's VEGAN!!! Ack?!!!! Vegan pecan pie?!?!? Unheard of. There is always a boatload of butter in there- and sometimes eggs. A legit vegan could make a pecan pie with vegan crust easily!! the recipe on the jar says to add melted butter. i bought some and will bake a pie this week. hope it's good! Why not just use a TJ's frozen pie crust? And you do need to add eggs to make it pie.